Welcome to our "Resource & Knowledge Center" on CML generics, copy drugs and substandard drugs. The Resource & Knowledge Center intends to pull together all information that is known to us to date. If you have additional information or feedback, please make sure you contact us at ! Market exclusivity for imatinib has expired in most countries between 2013 and 2016. CML patients have been increasingly exposed to generics and copy drugs in the treatment of CML, raising concerns about outcomes when patients are switched between products for non-medical reasons. The CML Generics Declaration has been published as an open-access article in the renowned journal LEUKEMIA, doi: 10.1038/leu.2016.220. Read the declaration here. It is also available in Spanish. We have compiled an inofficial directory including all CML tyrosine kinase inhibitors (TKIs) that are - to our knowledge - available to date. Our CML TKI Register provides information on the product name, compound name, registration status of all TKIS available on the international markets, the name of the respective manufacturer and / or Marketing Authorization Holder (MAH) and the specific indication of each drug. If available, it also provides links to publicly available documentation. "Advocating on generics and fighting for quality of care"
"Generics in Haematology: The doctors’ and patients’ perspective"
This session in the EHA's Patient Advocacy Session, which the CML Advocates Network co-coordinated, addressed the issue of drug quality in generics, substandard drugs and copies from a pharmacology perspective, how the issue of drug quality is being addressed with governments, how the change to generics is being handled on a clinical level by hematologists, and the challenges and opportunities from a patient perspective. "The new realities: Generics and Copy Drugs in CML"
"Ideal World vs. 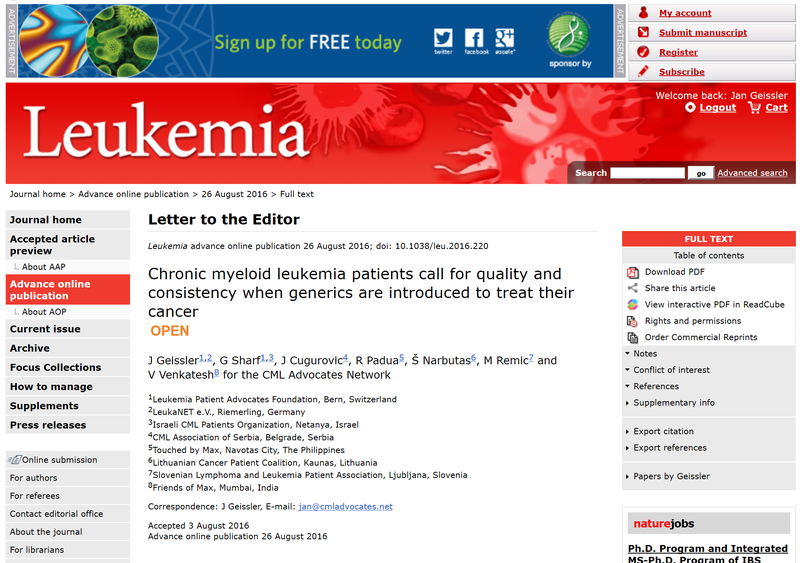 Reality: New Challenges with Substandard Drugs & Generics"
We are collecting all scientific publications and other credible articles that give some evidence on the quality, bioequivalence or efficacy of generic CML drugs or copy drugs. Please see the list of publications that are known to us to date. If you come across additional publications, please let us know so we can share it! Please visit our latest sub-section! In this new section we are collecting all newspaper articles and reports on generic CML drugs or copy drugs. Please see the current list of articles here. This sub-section lives only if you make it grow! So please share all articles related to CML generics and copy drugs that you come across! We invite our CML Advocates Network members to check out our newly created "Best Practice Toolbox on CML Generics" (for registered members, after login only). The Toolbox intends to provide CML patient groups with some guidance on advocacy initiatives that they may consider when planning activities on generics in your country. We will get started with a toolbox provided by our members organisation CML Association of Serbia who kindly accepted our invitation to share their experience in how to advocate for quality drugs in CML. This is a community-driven initiative and intended to grow over time. See our brief generics glossary that explains some key terms and definitions in the area of drugs and generics. Please also have a look at our in-depth CML glossary that explains more than 400 terms used in CML-related medicine and regulatory affairs. Let us know if anything important is missing! CML Advocates Network members are invited to join our newly established blog on generics. Your experience as a patient advocate in addressing this new advocacy challenge is very valuable - pease share it with other members of our global network. Start blogging now! This blog is only available for CML Advocates Network members after login.